In the late 1970s, a series of significant enhancements in technology further accelerated the evolution of the digital age. 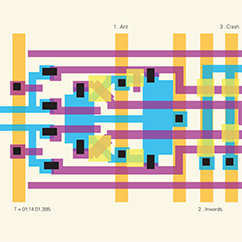 Graphical interfaces, networked computers and new software tools allowed to design and manufacture integrated circuits with tens of thousands of functions on one chip; a process called Very Large Scale Integration - VLSI. The structures became so complex, that for the first time computers were needed to build the next generation of even faster computers. As a result of that evolution, the heart of a computer could now be put onto a single chip - the microprocessor was born. It made possible the move from large mainframe systems to personal computers, allowed teenagers to build systems in garages and become billionaires, gave birth to the game industry, and also enabled the creation of completely new electronic musical instruments: digital sound generators, drum machines, samplers and effects. 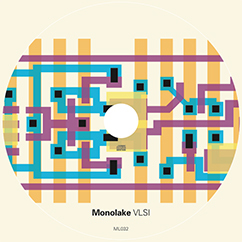 Most of the signature sounds on the VLSI album were programmed using early digital synthesisers; machines built by individuals or small teams of adventurous engineers and music enthusiasts during the 1980s, stretching the imagination of what could be done with a handful of chips and a good idea. 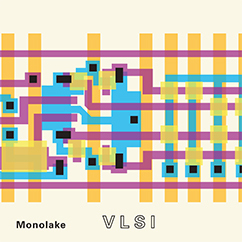 VLSI marks the endpoint of a series of six EPs, released between 2014 - 2016. The source material from these EPs has been re-arranged and augmented for the album, with additions of previously unreleased pieces. Produced by Robert Henke 2014-2016. Pio co-produced by Electric Indigo. Mixed by Mark Ernestus and Robert Henke. Design by Snc. 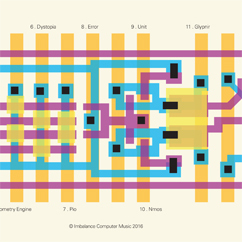 Graphics adapted from 'Introduction to VLSI Systems' by Mead Carver and Lynn Convey, 1979.